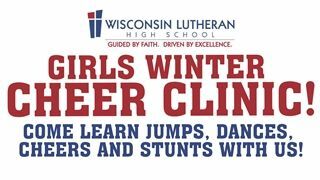 The Winter Cheer Clinic, for grades K4-8, has been rescheduled for Sunday, February 17, from 1:00-4:00 p.m. It will be held at a NEW location, in the gym at St. John’s Lutheran School, Wauwatosa. Come learn jumps, dances, cheers and stunts with us! Parents showcase starts at 3:45 p.m. Cost is $25. Click here for registration form.